The Barra MacNeils » The Barra MacNeils National Christmas Tour makes its way from coast to coast again this year! November 19, 2018: The Barra MacNeils National Christmas Tour makes its way from coast to coast again this year! This year anyone attending a Barra MacNeils Christmas concert will also have an opportunity to win a trip to Cape Breton Island through a partnership with the Island’s tourism organization Destination Cape Breton. Details will be provided at each live performance. About the Barra MacNeils: Multi-award winners and Canada’s Celtic ambassadors, the Barra MacNeils have released over 17 recordings and DVDs. They continue to perform to sold out audiences throughout Canada, the United States, the Caribbean, the United Kingdom and Europe. 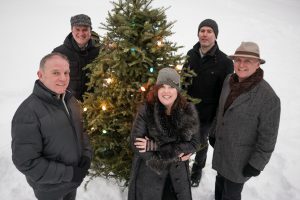 From headlining major festivals, concerts, special guest appearances (Rita MacNeil’s CTV Christmas Special, performing with The Chieftains) television specials, film and television placement (Men with Brooms soundtrack; Racket In The Attic) and their annual Christmas tour, they have set the course with a solid foundation for success.